Almost 20 years of The Chronicle from Winston-Salem are now online thanks to our partner, Forsyth County Public Library. Issues of The Chronicle continue to be published on a weekly basis, and this new batch covers the years 1997-2016 minus 2000. This batch joins previously digitized issues spanning 1974-1996. 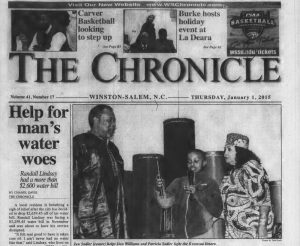 The Chronicle targets the African-American community in Winston-Salem, and their website states, “We focus on positive news happening in Winston-Salem and some surrounding areas.” Topics covered include Arts & Lifestyle, Business, Education, Local News, Government, Health, Religion, and Sports. These papers offer a look at Winston-Salem’s changing and cultural landscape and community from the 1970s through today. Click here to browse through all digitized issue of The Chronicle. To see more materials from Forsyth County Public Library, visit their partner page, or take a look at their website. To learn more about The Chronicle and check out recently published articles, visit The Chronicle’s website.